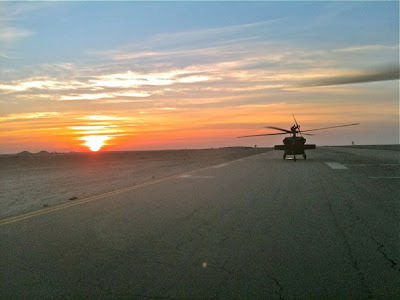 Back on Christmas Day, I dedicated a post to my brother-in-law, Sam, who is currently serving our country as an Army helicopter pilot in Iraq. Then, as many of us are guilty of doing, I went back to my shopping and hanging out with friends and DVR and Starbucks. Quite honestly, I sometimes think that's a tiny part of what Sam and his fellow soldiers fight for--for us to go about our business, living our lives in freedom. Freedom from fear and freedom from terror. I know military life overseas has changed drastically from the days my grandfathers fought the Axis powers and when my dad spent a year in Thailand with the Air Force during the 1970s. I thought it might be interesting for us to hear more about a soldier's life from Sam, so I am putting together a little series of interviews. 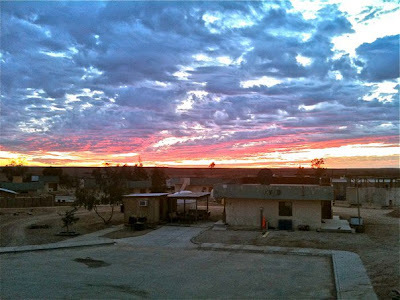 Today's gives us a bit of insight into how a soldier prepares to deploy and what he might miss the most. Upcoming interviews will follow Sam's job, where he lives when he's in Iraq, and what he does when he's not working. 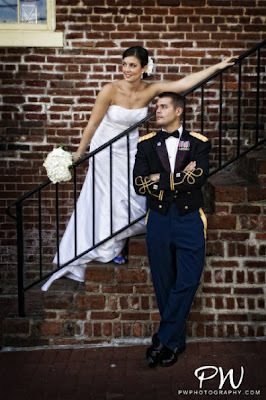 Here's a bit more about Sam, a US Army Captain, who married my sister in Septemer, 2009. They've known each other since 4th grade, and started dating in high school! 1. What is your job in the Army? 2. What's your favorite thing about being in the Army? Solving problems, helping my Soldiers learn and progress, the MEDEVAC mission, and, of course, flying. 3. When you are in the States, where are you stationed? 4. Where are you currently? 5. Once you know you'll be deploying, how long does the Army typically give you, and what do you have to do (at home and work) to prepare? I hate to say "it depends," but I'm going to. It depends. Most conventional units typically have been doing a year deployed and a year or so at home. One can generally anticipate future deployments about 10 months out. Each unit is different, and many get much less notice. 6. I'm guessing you don't get a first-class ticket on an airliner to the Mid-East. How do you travel, and how does your helicopter get there? We travel on chartered airliners to get to Kuwait . They are on regular airplanes with flight-attendants, meals, etc., except that all the seats are for deploying/military personnel. Our helicopters get packed up and put on a ship a few weeks before we leave the States. We pick them up at the seaport in Kuwait, do some required maintenance, and fly North from there. 7. Is the trip less daunting, since this is your second time in the Mid-East? I'm not sure "daunting" would be the word I'd use to describe it, but there are aspects of the job that are easier the second time around. I have a lot more knowledge of my job and aviation experience...that certainly helps. The biggest change is that there are many fewer combat casualties this rotation, so that is a pretty significant change, and a good one. I guess that makes it easier, but being away from Alison- 16 weeks pregnant-makes it tougher to be away this time around. 8. We know you miss your beautiful wifey. Name one thing you miss. Too many to list. I guess I should say I miss the day-to-day interaction the most. The last time we lived in the same location was Ballad, Iraq, in 2008. Needless to say, we are really looking forward to setting up a home and being "normal" for awhile. Being apart has really made me appreciate the little things. 9. If you could sit down at any restaurant on date with Alison right now, which one would it be? That's all I have for today's interview. I hope it gave you a neat peek at what it's like to be in the Army. Next time I'll be asking Sam for some more information on what's it like to fly helicopters, and I have some great photos to share! For today...please don't leave ME a comment. I'd love it if you'd leave a note for Sam and his fellow soldiers in Al Anbar. If you have any questions about a soldier's life in Iraq, please email me, or ask here and I'll include them in the next interview. Sam reads this blog all the way in Iraq (out of familial duty) and I thought it would be nice for him to see some encouraging notes today (or tomorrow...I'm not good with time zones). Come back tomorrow for a fun GIVEAWAY! Thank you so much Sam! For all that you do and for all that you sacrifice. You, and all of your brothers and sisters, are truly appreciated! Thank you Sam for all that you do. My brother will be graduating from Marine Boot Camp, and I could never be more proud. It takes a lot of courage to do what you guys do, and you deserve all of the respect for the sacrifices that you make each and every day. THANK YOU. Such feeble words to offer, but they come from a very, very grateful heart. My Uncle Richard, who is my namesake, was gravely wounded in Viet Nam. If it were not for a brave and dedicated helicopter pilot, he would have died on the field. I can't imagine my life without him. . . yet if it weren't for someone like you, I would not have had him in my life. To say that your work is important is a terrible understatement. God bless you for what you're doing every day and for what you're giving up every day. I appreciate you so much. Sam, thanks for taking time out from your busy schedule and sharing with us a little bit about yourself. Its hard for us to know how life is over in Iraq. Please know that everything you do will never be completely understood but truly appreciated. Be safe and know that you will be included in my prayers for a safe return to your beautiful wife and soon to be beautiful baby. Sam - I can barely hold back my tears as I read this post. Thank you hardly seems enough to show the graditude I feel in my heart for all soldiers who put their lives at risk to protect us. I don't think many people, myself included, realize just how much you give up on a daily basis. I am so very proud and thankful for you and all people who serve our country. I wish I could convey those feelings, but their are no words good enough to let you know how much we appreciate you. Our thoughts and prayers are with you everyday. Be safe and know that we are thinking of you and all the sacrifices your wife and family make daily. Thank you. Thank you doesn;t seem like BIG enough words to express the gratitude for what you and your fellow soldiers are doing for us and our country. But since I don't know how else to say it...THANK YOU! Praying for your safety and safe return home. What an amazing job you do. I lived the day to day military life for a few years including having a loved one be deployed & know how hard it is to be away from family. But how rewarding to be able to serve your country along fellow americans who fight for the best cause there is out there, our freedom. Thank you just doesn't seem to be enough but I say it with a sincere heart, thank you. Thank you Sam for serving our country. Thank you for the sacrificies you make so that we can enjoy our freedom. May God bless you always, and bring you home safely!! Thank you so much for all that you do to defend our country. We owe so much to all the men and women in uniform. I love these posts! First I think it's very important to give non-mil people, like myself, an insight into just how many sacrifices our troops make for us and as a reminder of how good our lives really are. Thank you Sam for all that you do for our country! As the older sister of a soon to be married to an army 2nd lt, what reassurance would you offer to a non-mil family to ease our minds about mil life? Thank you again to you and your family for all of the sacrifices you make! Thank you Sam for all you do. Thanks for sharing some of your pictures. Take care and come home safe. Sam, congratulations on that new baby! I pray that you will soon be together with your wife and out of harm's way. All that you do every day is so appreciated by all of us here at home, especially the families of those wounded that you help. God bless you! God bless you, Sam! And all the other men and women in uniform. THANK YOU for defending our country, our FREEDOM! Thanks for the peek into your military life. God Bless you and all of your troop-mates and thank you for fighting for freedom throughout the world!! Howdy Sam- thanks isn't quite enough for all that you're doing for us but I'll say it anyway~ THANK YOU and I'm sending you a big cyber hug! You and your wife are a beautiful couple. Sam, thank you for all that you do. My thoughts are with you and the other men and women that defend our country everyday. Love the pics of your and your wife, you guys are a beautiful couple! Thank you for all you and your men do. In my mind you all are heros, but as I'm told frequently by my brother who is also in the Army (Maj stationed currently in Germany but previously of the 82nd Airborne & 1st Armored Div) "It's just my job and what I'm supposed to do." Stay safe and Godspeed to you all. THANK YOU Sam for standing up for liberty and freedom. You are respected more than you know. My brother spent four months and the Christmas holiday of 2008 in Iraq with the Air Force and MY sister-in-law and her three kids stayed with us for two of those months. It was nice having family together but I saw how much breaking up a couple really takes a toll on a marriage. They are happily reunited and going on 12 years of marriage. BLESS YOU and all that you do. Thank you so much Sam for all that you and your fellow soldiers do for us. We appreciate you and the sacrifice you are making on our behalf! I hope and pray your tour is a safe one and that your are home soon with your bride and the new little one coming! Sam, I am grateful for you and other brave soldiers just like you that sacrifice their own lives to give our country freedom and keep us safe. I have much respect for you and your family. I personally know how hard it can be to be away from the ones you love...my husband is a Captain in the Air Force and many times we have been without him. Thank you for sharing insight into your life and congratulations on your new marriage, you two are a beautiful couple! I pray for your safety and all the other men/women who serve our country to return home safe as well. Thank you, forever grateful!! May God bless you! Thank you Sam for your hard work and dedication to our country! All of us stateside can't thank you enough for putting your life at risk for our Freedom! Best of luck to you and your beautiful wife, and hey you've got one fabulous sister-in-law too! God Bless you for your work over there for us and the other servicemen and women! And to your wife for loaning you out in service to our nation :) Being newlyweds and so far apart has to be so hard for both of you, and your sacrifice is greatly appreciated. Thank you so much to both you and your families. We are so grateful for the sacrifices you are all making for us! Sam -We have many loved ones in the military, and our gratitude is deep and heartfelt. Thank you so much for your sacrifice, as well as that of your family. You and all who serve are in our prayers daily! Thanks Amanda for the great interview. Very important stuff. If it wasn't for you and your fellow soldiers I wouldn't be sitting here with my family watching American Idol and creating memories with my girls! Your service, commitment and hard work is so appreciated. I can not think of any words to describe my gratitude other than Thank You! I pray for you and your fellow soldiers day and night. God bless you and your family for your sacrifice. Thank you for ALL that you do! What a great post. As the wife of a former Navy guy who was in Operation Desert Storm, I know the sacrifice of not only the soldier but the wife left at home too. My gratitude to Sam and his lovely bride. 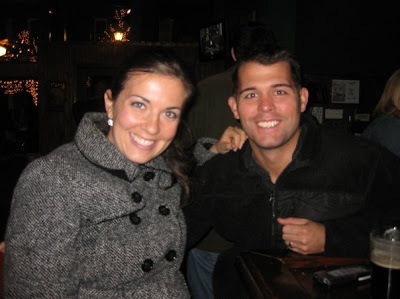 Sam, I'm so thankful for the sacrifices you and alison have made in order to serve our country. To be away from your wife and family is difficult enough, but to miss out on her pregnancy has just got to be the worst. My sister Heidi (Sawyer) is going back for her 2nd tour this summer and she can relate to the sadness of leaving her children while she serves. So thank you. Thank you both and be safe!!! Thank you Sam! Your committment to our country is as gorgeous and inspiring as your amazing photographs! Thank you Sam for all that you and the other soldiers are doing for our country! We appreciate you so much. ugh- i'm all teary. i don't know why, exactly, since this was a great, and not at all depressing article! well done, amanda. thank you so much for all you do and have sacrificed in service to your country (and others!). you are appreciated and prayed for. i love your pictures. thank you for sharing them with us. I'd like to first of all say a big THANK YOU for the work that you do! I really truly appreciate the sacrifices (on so many levels) that you make for our country and for helping others. So, Thank You from the bottom of my heart! Amanda, I'm a first-time visitor to your site from Cleveland, OH. I saw your blog link on Jennifer's Hope Studios blog and decided to check it out. I'm glad I did. Sam, as echoed above, thank you for everything you do. I complain about a lot of things on my blog, but never about the armed forces. You keep us safe and I can't even begin to imagine everything that you've been through and go through every day. Stay safe and know that my family thinks of (and thanks) you and your fellow soliders each and every day. Sam and soldiers - thank you for your sacrifice and service to our country. May we never forget or take you for granted. God bless you! Please tell your brother-in-law "thank you" from all of us, here back in the states. My husband was MEDEVACED from Baghdad to Germany shortly after being wounded in June of 2007. I'm so grateful for his and other pilots service, and for being apart of the team that brought my husband back to me.